FAA Operations & Performance Data provides access to historical traffic counts, forecasts of aviation activity, and delay statistics. Most of the following databases contain proprietary information and require a registered user name and password. You may request a login from FAA. Aviation System Performance Metrics (ASPM): A broad collection of systems for reporting on the traffic and performance of the 77 ASPM airports and more than 35 airlines. 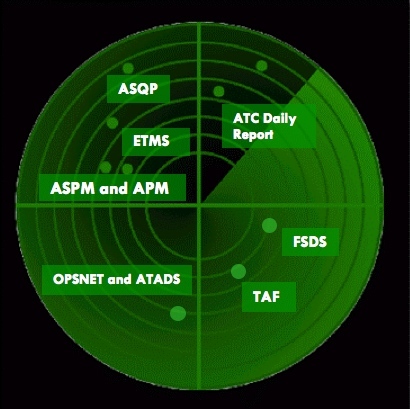 Operations Network (OPSNET): Official FAA Operations and Delay Data. Count of Operations (CountOps): Hourly counts of air traffic activity at TRACONs, towers, and airports. Traffic Flow Management System Counts (TFMSC): Traffic by Airport from TFMS flight messages. Airline Service Quality Performance (ASQP): Traffic and Delay for the largest U.S. Carriers. Flight Schedule Data System (FSDS): Flight Schedule Data. Terminal Area Forecast (TAF): Official FAA Forecast used for Planning and Investment. This page was last modified on 13 June 2018, at 09:08. This page has been accessed 477,496 times.